He was born in St. Louis, MO, He grew up in Senegal. His family (including his father, jazz percussionist Mor Thiam) returned to the United States and settled in New Jersey when he was seven. There he discovered hip hop for the first time, as well as crime. He was eventually arrested but he used the time three years, he claimed to work on his musical ideas. After release, Akon began writing and recording tracks in a home studio. 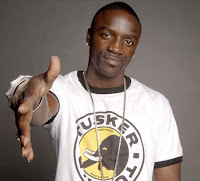 The tapes found their way to SRC/Universal, which eventually released Trouble, Akon's debut LP, in June 2004. The album was an interesting hybrid of Akon's awesome silky, West African styled vocals with East Coast and Southern styled beats. The success of the song "Locked Up," a Top Ten Billboard 100 hit, made Akon a star and desired collaborator. After appearing on Young Jeezy's "Soul Survivor," his number of guest appearances seemed to multiply each month. Konvicted, his second album, was released in November 2006. Soon enough, two of the album's singles, "I Wanna Love You" and "Smack That," made their way to the upper regions of the Billboard music charts. The surprisingly pop flavored Freedom, his third album, followed two years later, and it repeated Konvicted's chart success by peaking within the Top Ten of the Billboard charts. Akon grossed $21 million in 2010, $20 million in 2009 and $12 million in 2008. He has worked with numerous performers such as Michael Jackson, R. Kelly, Eminem and Whitney Houston. He is the first solo artist to hold both the number one and two spots simultaneously on the Billboard 100 charts twice. He has had 6 Grammy Awards nominations and has produced many hits for artists such as Colby O'Donis and Leona Lewis. Lady Gaga and T-Pain are two artists who were given their chance at fame by Akon.